Today is #BevCrusherDay. 13 October is Beverly Crusher’s birthday, so what better way to celebrate than writing a short fic or two about our favourite doctor? This will be cross posted to Ao3 and my personal blog, and Tweeted on both AnnaOnTheMoon and Gates_Daily.. It’s also Flufftober, so if you follow me on Archive of Our Own, you’ll find a daily fluffy piece about our favourite couple! Disclaimer: I don’t own TNG, Beverly or Jean-Luc. I don’t work for Paramount, CBS, PocketBooks, Simon & Shuster…etc, etc. I’m just a fan! 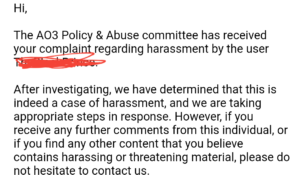 I also ask for forgiveness from Gates McFadden and Sir Patrick Stewart for using (abusing?) their characters. “Sounds lovely. Just let me change first.” She gently kissed Jean-Luc’s cheek and disappeared into her bedroom. Jean-Luc peered into one of the open crates, and seeing the jumble of books inside, he decided to help her by putting the books back on her shelf. He didn’t know if she had a particular way of organising them, but at least it would get them out of the crate and she could arrange them later. 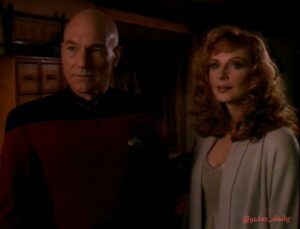 At the bottom of the crate, Jean-Luc pulled out a picture frame with a photo of Beverly, Jack, Walker, and him taken over twenty years ago. He studied the picture and grinned, remembering the day well. They had gone camping together at Balfour Lake and they had spent the day splashing in the lake before Walker set up the camera to take a timed photo of the four of them. In fact, picture Beverly was sporting a deep sunburn on her chest, and Jean-Luc remembered Beverly complaining about how much she had wished she had thought to pack a dermol regenerator that weekend. “Mm. 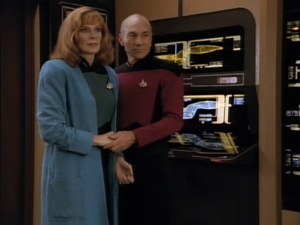 But at least we have each other.” Jean-Luc reflected on her words and made a snap decision. “It’s alright. I…I did what I did to keep you safe. That was all that mattered to me.” Beverly wiped a tear from her eyes and she adjusted the straps on her pack. They were treading towards their feelings again, and she still wasn’t sure if she was ready. She had patted herself on the back for managing to keep her feelings hidden when they had been attached to each other’s thoughts, but the more she thought about it, maybe it would have been better if she had just admitted her feelings. He knew. 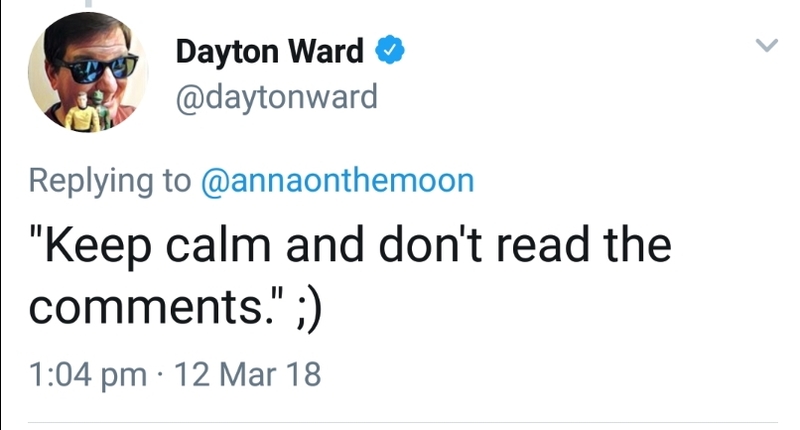 He had to know. “Well…alright, maybe not all the time. I mean, when I was with…that…thing….I’m not sure I’d have wanted you to feel…what I was feeling.” She blushed. He grinned. “I take your point, but maybe if you could have felt what I…” he trailed off, embarrassed. Jean-Luc led her to a small clearing, nearly identical to the campsite they had used twenty-odd years ago, and the same site she and Jack had taken Wesley to when he was three. She and Wesley had been back a few times after Jack passed away, but they hadn’t gone camping since he was 12. “Just like I remember it.” Jean-Luc nodded . “I haven’t been here in years – the real one, I mean. You?” Beverly shook her head. “Not since Wes was about twelve. It was around that time when he became too cool to go camping with his mother.” She frowned. “Thank goodness for self inflating mattresses.” Beverly tugged the packs into the tent and unhooked the rolls from the bottom of each bag. After unrolling and pressing the inflate button, Beverly was left with deciding where to place each bed. She remembered you didn’t want to be touching the side of the tent while you slept or you’d get covered in condensation, which would in turn make you cold. But placing the beds in the middle…did she give them a small berth between or place them touching? When they had slept on KesPrytt, they had started out sleeping side-by-side with their backs touching until Beverly had complained and Jean-Luc had told her to use his shoulder for a pillow. She grinned, remembering how he had gingerly wrapped an arm around her and she had fallen asleep listening to the steady beat of his artificial heart until his dream woke her up. She placed the beds side-by-side and zipped the two sleeping bags together to form a double sleeping bag. If Jean-Luc had programmed the night cycle as accurate as the day cycle, they would want to share their warmth as Beverly hadn’t seen any heating devices in either packs. “Thanks.” Jean-Luc glanced at her before turning his back and groaning. Why was it so hard for them to be in a relationship with each other? What he really wanted to do was to sweep her into his arms and kiss her, but instead he pulled towels out of their packs and tied one around his waist before heading towards the shore with a towel for Beverly. “Fire should be going nice by now. I put a few potatoes and some corn on the cob in there before I joined you, they should be cooked by now. I did cheat slightly. I planned for steak to be delivered right about now.” A transporter beam activated and two large plates arrived, filled with steak fillets and salad, along with two glasses of wine, the rest of the bottle, and two pots of chocolate mousse. Jean-Luc shook his head. She turned and went into their tent and rummaged for something comfortable to wear. Fortunately, Jean-Luc had packed her a pair of sweatpants and a camisole, but she grinned and dug though his pack until she found one of his soft shirts and pulled it on instead. She emerged carrying a brush, and Jean-Luc merely raised his eyebrows and shook his head as he went to have his turn at changing. “Computer, create bathroom complete with shower, toilet, running water and appropriate toiletries.” A large bathtub with a shower appeared alongside a toilet and a sink. “Mm, yes. And we don’t want that wine to go to waste.” Jean-Luc turned off the stasis field keeping their dinner warm, grateful for small technological advances. In the morning, he would have breakfast beamed to the campsite, too. They ate together, exchanging the occasional friendly barb and when they were done Jean-Luc put their plates to one side and lounged back on the blanket and pulled Beverly against him. Beverly threaded their fingers together and tried to find the words she wanted to say to him. He was her best friend…and more. So much more. She took a deep breath. “Phil and Jenice were a long time ago. Jenice was before I even met you. Kamala was never a girlfriend, she just imprinted on me because I treated her well. Vash…I’m not sure I have an excuse. I’ll blame that one on Riker and his Horga’hn. And Nella….well, quite simply, my love, she wasn’t you. So no. I can’t say that a girlfriend would get in your way. What about you? Planning on dating anyone?” Beverly shook her head. “Of course. We have all the time in the world.” He leaned over and kissed her again. “Tempting just to see what you would do, but no. You can keep it.” He turned on a small lantern so they could see to get into the tent and their their joined sleeping bags. Jean-Luc turned off the lantern and pulled Beverly against him. He kissed the top of her head. The Stargazer docked with Starbase thirty-two with a click of the stays and Jack and Jean-Luc were the first to debark alongside their other best friend, Walker Keel. They had come to the base specifically to celebrate Beverly’s twenty-fifth birthday, and to visit Wesley, the apple of his father and honorary uncle’s eyes. “M m m m m m m m.” Jean-Luc chuckled. “That’s a start. Jack and Walker are down the hall. I won.” Jean-Luc puffed out his chest with pride and Beverly laughed. Walker grinned at his friend as Jack greeted his wife and son. “When Beverly married you, she married all of us.” Beverly took Wesley from Jean-Luc and passed him to his other uncle. “Great! I need husband number three to change Wesley’s diaper.” Walker grumbled, but took the giggling baby into his bedroom. Beverly winked at Jean-Luc. Summary: Â Jean-Luc decides the shipâ€™s school needs a Doctor Beverly Day. A/N: So I had a dream last night….this is the dream.Â Doesnâ€™t everyone dream of P/C? 13 October is Beverly Crusherâ€™s birthday, so what better way to celebrate than writing a short fic or two about our favourite doctor?Â This will be cross posted to ff and my personal blog because I plan on sharing this fic on Twitter and I donâ€™t want to use my ff account publicly.Â So if you see this in two places, thatâ€™s why.Â I know it was yesterday, but Iâ€™m still adding this one to my submissions. 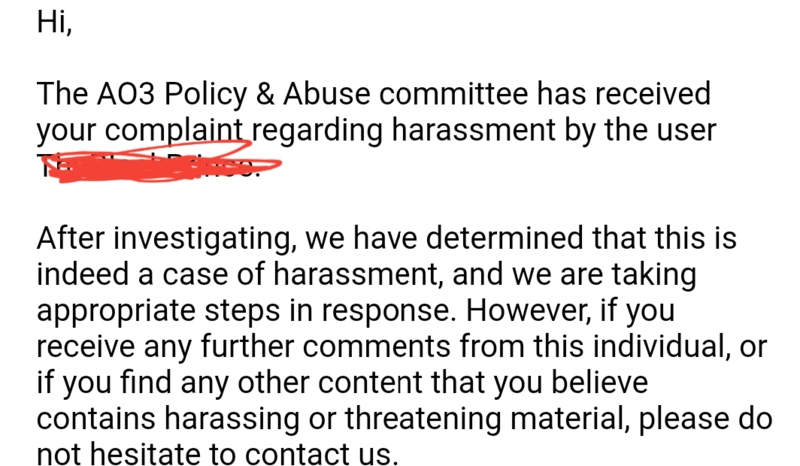 Also, the disclaimer for posting to my blog: I donâ€™t own TNG, Beverly or Jean-Luc.Â I donâ€™t work for Paramount, CBS, PocketBooks, Simon & Shuster…etc, etc.Â Iâ€™m just a fan!Â I also ask for forgiveness from Gates McFadden and Sir Patrick Stewart for using (abusing?) Â their characters. Beverly looked around the room in astonishment.Â â€œJean-Luc….you really didnâ€™t have to do this.â€Â They were in one of the conference rooms.Â A large painted banner hung across one end proclaiming it to be â€˜Doctor Beverly Dayâ€™. Jean-Luc cut her off. â€œSo what better way to thank you?â€Â Jean-Luc gestured to the table heaving with drawings, short stories, poems, clay figures, and even a small doll.Â Jean-Luc picked up one of the poems. 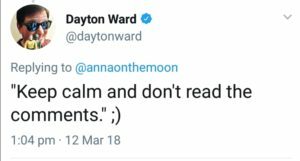 â€œYou donâ€™t have anything to worry about. I prefer my men older…and bald.â€ She whispered the last word into Jean-Lucâ€™s ear and gently nipped it. Jean-Luc tucked the doll under his arm. â€œI donâ€™t know what youâ€™re talking about, Doctor.Â Oh, it looks like the children are ready to perform, shall we go watch?â€Â Beverly was about to reply when a little girl with bouncing red curls tugged on the Jean-Lucâ€™s trouser leg.Â Jean-Luc looked down at the child and tried to scowl, though his eyes were smiling. â€œYes?â€Â The little girl motioned for Jean-Luc to pick her up.Â Jean-Luc shrugged and bent down so the girl could wrap her arms around his neck as he carefully lifted her.Â The little girl pointed at the doll tucked under Jean-Lucâ€™s arm and exclaimed â€œMama!â€ Jean-Luc smiled.Â â€œYes, the doll does look like Mama.Â Would you like to play with it?â€Â The little girl nodded.Â Jean-Luc handed the doll to the girl and she slid out of his arms to go join her friends. â€œUh.huh. Anâ€™ heâ€™s loud!!! !â€Â Yvette giggled.Â Jean-Luc groaned.Â The other crewmen in the room tried to hide their smiles. Forgive me for posting another fic on my blog, but again, I wanted to share it on Twitter for #BevCrusherDay. If you’re looking for any of my other fic, it’s on fanfiction.net. If you search for the title of this story, you’ll find my other stories. Dispensing with the usual copyright footer, since as I stated, I don’t own TNG or the characters….only my words. *Image via Pinterest. I’m assuming it’s from Nemesis? Summary: Â Take place mid-Season 5 during episode 21, The Perfect Mate. Beverly celebrates her birthday without her best friend. A/NÂ Today is #BevCrusherDay.Â 13 October is Beverly Crusherâ€™s birthday, so what better way to celebrate than writing a short fic or two about our favourite doctor?Â This will be cross posted to ff and my personal blog because I plan on sharing this fic on Twitter and I donâ€™t want to use my ff account publicly.Â So if you see this in two places, thatâ€™s why. Beverly kicked off her boots at the door, flung her lab coat over a chair and headed straight for the liquor cabinet.Â She rummaged around until she found the bottle of wine Jean-Luc had given her for her birthday last year and grumbled about men and how they canâ€™t be bothered to remember dates from one year to the next. But he had been so obsessed with Kamala that he seemed to have even forgotten who she was! She supposed it was her own fault. Â She was the one who had pressed Jean-Luc to allow Kamala to leave her quarters…she shook her head.Â No. Itâ€™s Jean-Lucâ€™s fault for finding her so damn alluring.Â He just canâ€™t help but want to solve a puzzle. Itâ€™s one of the reasons I lo….no, stop that. She poured herself a glass of wine and took a sip.Â She noticed the light blinking on her console and went to check her messages.Â Her sonâ€™s face filled the screen. Wesleyâ€™s face faded out and Beverly chuckled. Miss you too, Wes.Â She checked her other messages.Â There was a written message from her Nana on Caldos, Â a message from her old mentor, Doctor Quaice, and an invitation to meet Deanna and Will in Ten Forward for a birthday drink.Â She glanced down at the glass of wine she was drinking and shrugged, tipping it back before going to change.Â Her bubble bath could wait. Seeing her friends would be a pleasant way to spend her birthday. Of course, the conversation in Ten Forward revolved around the metamorph.Â Beverly frowned as she accepted another drink from Guinan. Beverly shook her head. â€œThank you for the drink, but I better be going.â€Â Beverly placed her empty glass on the bar and stalked out of the bar.Â Of all the nonsense Iâ€™ve ever heard out of Guinan.Â Me? Moping?Â Over Jean-Luc? !Â She stalked her way into the turbolift and made it back to her quarters and headed straight Â for the bathroom, grabbing the bottle of opened wine and a glass as she sailed past the table.Â A long soak in the tub was just what this birthday girl needed. She grabbed the PADD with the current holonovel she was reading in her other hand as on her way past her bed.Â Bubbles, books, and wine was all a girl needed to celebrate her 45th birthday…right? Several hours and multiple â€œComputer, raise bath temperatureâ€s later, Beverly finally decided to haul herself out of the bathtub.Â She was wrapped in a fluffy towel drying her hair when she heard her door chime. Who could be bothering me at this time of night?Â I hope itâ€™s not an emergency….out loud, she spoke the command to open the door. â€œAh…yes…happy birthday Beverly.â€Â Jean-Luc held out the items to her. Beverly laughed. It was so easy to rile Jean-Luc up.Â â€œI know what you meant.Â But please sit. It will only take me a minute.â€Â Beverly retreated back to her bedroom silently laughing.Â Perhaps tonight would be a good birthday, after all.Â She returned to her living area a few minutes later, clad in a soft pair of leggings and a long sweater.Â She accepted her glass from Jean-Luc and curled up on her sofa, tucking her legs under her.Â How many glasses of wine does this make for today?Â Four? Five?Â Whoâ€™s counting. â€œI ah…went to the liberty of replicating some nibbles to go with the wine,â€ Jean-Luc indicated the plate on the low table. Jean-Luc shook his head.Â â€œBeverly, I donâ€™t even know who she is. She changes depending on who is in the room with her and yet….I find her slightly alluring….â€ Beverly frowned.Â â€œIâ€™m sorry, itâ€™s your birthday and here I am pouring out my soul to you…but I guess I needed a friend.â€Â He reached out and took her hand and gave it a squeeze. â€œNo. I needed you.â€Â Beverly placed her glass on the table and bridged the gap between the two of them to pull him into a tight hug. I know I don’t usually post fanfiction on my blog, but bear with me…. Summary: Jean-Luc surprises Beverly on her 46th birthday.Â P/C light. Beverly checked the time.Â 0700.Â Her shift ended at 1500, so that would give her just enough time to change.Â Her relationship with Jean-Luc had been strained lately. Â After he was rescued from Celtris III they had a long chat and he admitted to her they had told him she was there and it had been thinking about keeping her safe that had kept him complacent. She wept when he had told her, and the evening was spent with the two of them holding each other.Â They had fallen asleep together on Jean-Lucâ€™s sofa and it lead to…well, not really seeing each other, but their breakfasts had turned into also sharing dinner most nights and they had a comfortable relationship. It never quite crossed the line, but it sort of teetered on the edge.Â In their 20-year friendship, they had shared only a handful of kisses prior to a few weeks ago.Â But since Jean-Luc returned they seemed to have been kissing each other more frequently.Â Never more than just a kiss, but it all felt warm and comfortable….and then Nella happened. Beverly should have known something was up the minute she reached for Jean-Lucâ€™s hand during Dataâ€™s concert and he pulled it away.Â And then when Nella had the audacity to come into her Sickbay to tell her she was injured while playing with Jean-Luc!Â Nella was lucky Beverly had taken an oath to do no harm, thatâ€™s for sure . And Jean-Luc…well, it wouldnâ€™t have been the first time she showed up at his quarters for their standing breakfast date, but the last time had been years ago, and it had been Vash….who Beverly hardly had considered a threat to her relationship with Jean-Luc.Â But seeing Nella there in her seat sipping coffee as if she just belonged there had made Beverlyâ€™s blood boil. And then, Nella left. While on one hand, Beverly was thrilled that Nella had left, she also felt badly for Jean-Luc. He seemed to have fallen hard for the woman, dare she say, he might have even been in love with her?Â But the upside to Nella being gone is he had resumed his daily breakfasts with her.Â Beverly smugly smiled to herself. Nella, you never had a chance. This morningâ€™s breakfast had been simple. Â Jean-Luc had been fairly quiet and Beverly was a little disappointed he hadnâ€™t wished her a happy birthday.Â She thought perhaps it had slipped his mind, and she wasnâ€™t going to remind him.Â But now this invitation had her curious….had he been planning this all along? She put the thoughts out of her head as her first patient for the day arrived.Â No time to think about Jean-Luc and their non-relationship Â relationship right now. Beverly stood outside Holodeck Three, decked out in a blue blouse, black riding trousers, and riding boots.Â She felt a little silly as crewmembers shuffled past her, but then again, why should she?Â She was merely waiting for her companion. â€œWell, shall we?â€Â He took her hand in his and they entered the room.Â Beverly gasped. She was standing on a hill on a bright sunny day overlooking fields and fields of gentle rows of plants.Â A tudor-style house sat in the distance. They rode in companionable silence. Beverlyâ€™s horse was keeping pace with Jean-Lucâ€™s and she was enjoying the feeling of the wind running through her hair and on her face.Â Wind wasnâ€™t exactly something you got to experience often when you were on a starship. Jean-Luc surreptitiously watched Beverly.Â He loved the way her hair streamed behind her like a ripple of fire.Â He thought he might like to run his fingers through her hair, and then stopped himself.Â No. Best not think about that.Â He led the horses up another ridge and pulled his horse to a stop.Â Dismounting, he helped Beverly off her horse before pulling a pinic basket out from behind a tree. â€œPrepared, were you?â€Â Beverly asked with a twinkle in her eye. â€œHmm.â€ Jean-Luc quickly spread out the tartan blanket and pulled out a bottle of wine, two glasses, some cheese, baguettes, slices of apples, strawberries, and a small cake.Â â€œItâ€™s not much…â€ he said, passing a glass of wine to Beverly. â€œIndeed.â€Â Jean-Luc wrapped his arm around Beverly and pulled her closer.Â Perhaps this would be a very happy birthday indeed. *Screenshot image from the 4×05 Episode, Remember Me.